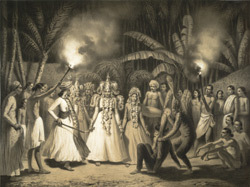 Lithograph of a theatrical performance by dancers and musicians in the jungle near Colombo in Sri Lanka by L.H. de Rudder (1807-1881) after an original drawing by Prince Aleksandr Mikhailovich Saltuikov of April 1844, published in 1848. Sri Lanka was a Portuguese colony from the late 16th Century until it was overruled by the Dutch; a colony which lasted until the arrival of the British in the late 18th century. The hill country capital of Kandy was the last kingdom to succumb to foreign rule, to the British in 1815. This print shows a performance where the participants are wearing traditional Kandyan dress.